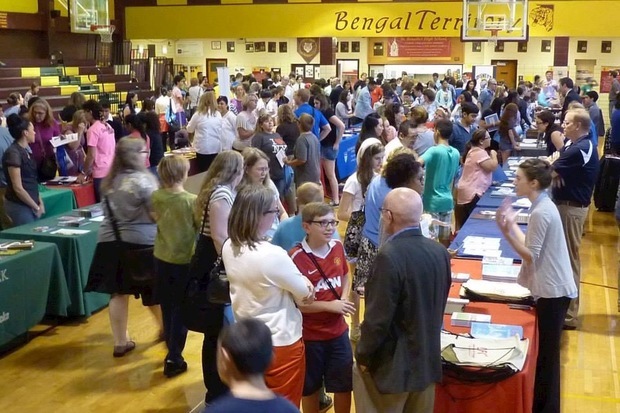 About 300 students attended the 2014 Hidden Gems High School Fair. This year, more than 35 schools will present what makes them unique to ease prospective students' burden finding the right school. LAKEVIEW — Getting into a good high school in Chicago can be tough, especially for students in high-poverty neighborhoods. One group of moms called Chicago School GPS is hoping to change that with an annual school fair highlighting public, private and boarding schools that could be your much-needed diamond in the rough. On Sept. 27, the fourth annual Hidden Gems High School Fair will feature at least 36 schools ranging from private boarding schools to public magnet and military schools. The fair kicks off at 1 p.m. at Lake View High School with a brief pitch on each school before students and parents can explore their options. "Oftentimes at these fairs, it's the schools with the flashiest giveaways that get people to visit their booths. We want families to hear what makes each school unique and allow the schools time in front of all attendees," organizer Grace Sawin said. Mini-seminars starting at 2 p.m. will dish the details on admissions, testing strategies and essay writing for both parents and middle school students. Sawin and a couple other mothers started Chicago School GPS after seeing how much work went into selecting schools for their children. Sharing their knowledge, the group has information on school applications, gifted testing and a school tour calendar. More than 300 people are expected to attend the Sept. 27 fair at Lake View High School, 4015 N. Ashland Ave. Admission is $15 per family with pre-registration or $25 at the door. Need-based vouchers are available upon request.